Carl Rasmussen is Professor Emeritus of Old Testament at Bethel University in St. Paul, Minnesota. 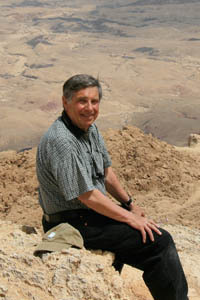 He received his Ph.D. in Ancient Near Eastern Studies from Dropsie University (now the Katz Center for Advanced Judaic Studies at the University of Pennsylvania). Dr. Rasmussen has spent 16 years of his adult life living in Israel, Jordan, Greece, and Turkey, where he taught and led academic study programs. Since his retirement from Bethel University, Dr. Rasmussen has continued to teach and lead adult study tours in Turkey, Greece, and Israel. Each year he spends time in Jerusalem, where he is Adjunct Professor at the Jerusalem University College. He is the author of The Zondervan Atlas of the Bible (2010) and The Zondervan Essential Atlas of the Bible (2013). He has created and maintains the web site www.HolyLandPhotos.org that features over 5,150 free high-resolution images of Israel, Turkey, Greece, Malta, Jordan, Italy and elsewhere."